Aemilia Ars Needle Lace and how to make it, its specific stitches and working methods. All skill levels. Barbara Cantelli's book, "L' Aemilia Ars di Antonilla Cantelli". It is excellent for following the patterns & then there are two others, Bordi & Fiori which have very good illustrations & steps for how to do the lace. All in Italian but the pics are very clear. from Silvia The group "I merletti di Antonilla Cantelli" has just launched this website. In the future it will be expanded and perhaps translated into English. "The following books about Aemila Ars, written in Italian with English translations, would not be a bad start. Un Bordo, Aemilia Ars. (A Border in aemilia ars.) Edition Il Punto Antico." A lovely geometrical border, a good point to begin in aemilia ars. This border can easily be broken up and used in smaller units. There are explanations in photographs. Aemilia Ars, Designs and Lace. An anastatic copy of an antique book, with a second book of explanations of the old designs. Also has explanations in photgraphs and an English translation. (Two small books in a slip case). Aemila Ars, Dai vecchi disegni ai nuovi merletti. An exhibition catalogue with a little more. There are also original designs and explanations of the working. All books by Il Punto Antico, Bologna, Italy. Refer to Pia Breviglieri who speaks english. Quaderni Di Aemilia Ars: Corso Base by Bianca Rosa Bellomo, Carla D'Alessandro, Luisa Monteventi. Should Amelia Ars always be white or should we be trying colour? Started by Anne Weston. Last reply by Elizabeth Ligeti. Mar 18, 2015. Started by margaret ruhland. Last reply by Carolyn Wetzel May 1, 2012. You need to be a member of Aemilia Ars to add comments! Yes, feel free to use it! The pattern is from Punto en Aere. That is exactly what I was looking for. May I use this on my personal website? Lorelei, do you mean another example of how the outline thread is laid down in AA lace? Here is a photo of a small piece I'm doing, showing the tacking threads and the first part of the outlining. The outline and underlying support threads are added as you go. Carolyn - You know far more about aemiliia ars that I do. What made me think that might be what it was, was the little red lines showing where the tacking stitches would be place. That appeared to be similar to the aemilia ars method. I had never understood that there were a specific set of stitches that go with that technique. What term can we use for lace that starts with minimal tacking stitches put down, and which guide the outline threads when they are laid down? It is a different method than the couching method for securing the outline threads. Here is an example, not a very good one, that I am referring to. Do you have a better example? Perhaps a simpler pattern, just to show the method? Lorelei, Grace's Lace website you shared has some excellent diagrams and interesting patterns. 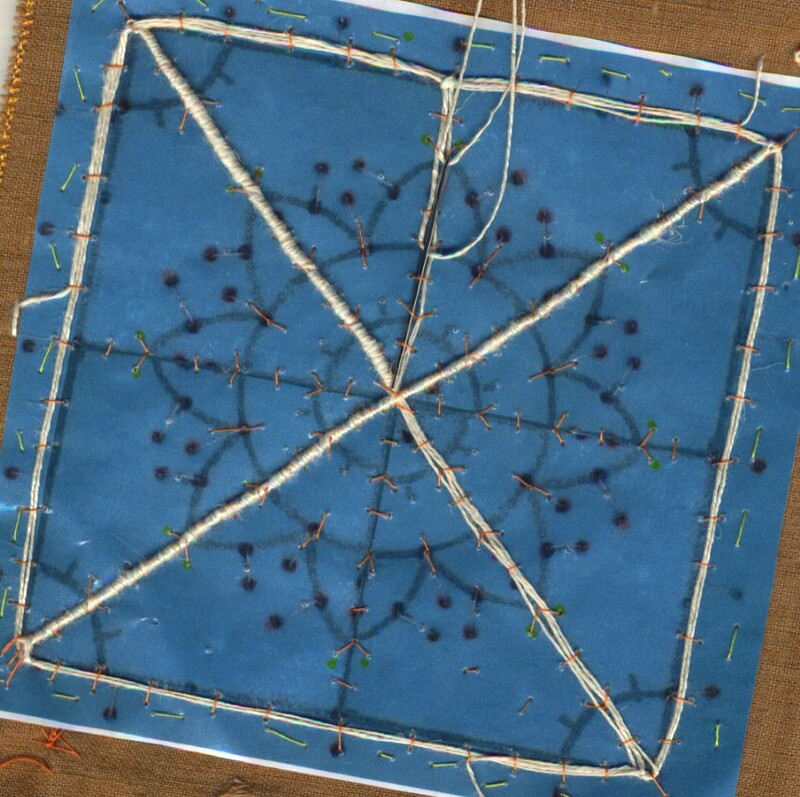 It is not specifically Aemilia Ars, though, because the picots are different, she does not use the knotted stitch (punto chiaro), and she outlines the triangles with thread before making them. There were many variations of techniques used in the 16th century in different regions, and she is just using a subset of them that is different than the subset chosen by the Aemilia Ars Society workers when they made their recreations of old lace. It's a wonderful site and I hope she adds more to it! Free lace patterns. I think they are aemilia ars in the working method. She also has good stitch diagrams. I cannot even begin to imagine what a wonderful experience that must have been. Good for you! They also showed me beautiful work that they and their teacher, Antonilla Cantelli, had made. And I saw all the AA lace that was to be found on public display in Bologna museums. Overall a highly rewarding 4 days! A really nice Aemilia Ars flower in the IOLI Bulletin. I'm going to work it. I copy the pattern on plain blue paper, cover it with matte clear contact paper, then put it on one layer of bookcloth (Arrestox) and one or two layers of cotton fabric, sewing all the layers together. The bookcloth gives it some flexible stiffness and durability, and the fabric back is comfortable against my skin.